The shape selection tool used to be called the “default” tool. This had to do with Krita being part of an office suite once upon a time. But this is no longer the case, so we renamed it to its purpose in Krita: Selecting shapes! This tool only works on vector layers, so trying to use it on a paint layer will give a notification. After you create vector shapes, you can use this tool to select, transform, and access the shape’s options in the tool options docker. There are a lot of different properties and things you can do with each vector shape. Selecting shapes works as follows. You can click on a shape to select a single shape. 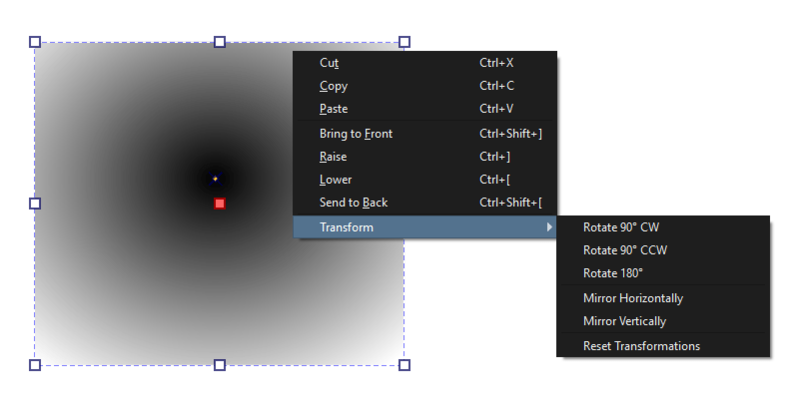 You can select multiple shapes with click drag. There’s two types of drag action, a blue one and a green one. The blue one is created by dragging from left to right, and will only select shapes that are fully covered by it. The green selection is created from right to left and will select all shapes it touches. Once an object is selected, a dashed box will appear around the object. There are handles that you can pull and stretch the box to scale it. If you move your cursor just outside the corner handles you can rotate the object. The tool options of this menu are quite involved, and separated over 3 tabs. Geometry is the first section. It allows you to precisely set the x, y, width and height. This is not implemented at the moment. When enabled, it will scale the stroke width with the shape, when not enabled, the stroke with will stay the same. Determines whether the width and height bars use the width and height of the object, while taking transforms into account. The general opacity, or transparency, of the object. The stroke tab determines how stroke around the object should look. The first set of buttons to choose is the fill of the stroke. This has the same features as the fill of the shape, so scroll down a bit for details on that. Then, there’s the settings for the stroke style. The width of the stroke is determined by this entry. When creating a shape, Krita will use the current brush size to determine the width of the stroke. If you press the button after the thickness entry, you will be able to set the stroke cap and the stroke corner style. Determines whether the stroke is solid or uses dashes and dots. Which markers can be added to the stroke. Markers are little figures that will appear at the start, end or all the nodes in between depending on your configuration. The fill of the shape. As this has the same features as the fill of the stroke, this is explained here as well. A flat color, you can select a new one by pressing the color button. This one has a few more options. A linear or radial gradient. How the gradient repeats itself. A quick menu for choosing a base gradient to edit. You can edit the gradient in two ways. The first one is the actual gradient in the docker that you can manipulate. Vectors always use stop-gradients. The other way to edit gradients is editing their position on canvas. The shape selection tool has a nice right click menu that gives you several features. If you have an object selected, you can perform various functions like cutting, copying, or moving the object to the front or back. If you have multiple objects selected you can perform “Logical Operators” on them, or boolean operations as they are commonly called. It will be the last item on the right-click menu. You can combine, subtract, intersect, or split the objects.